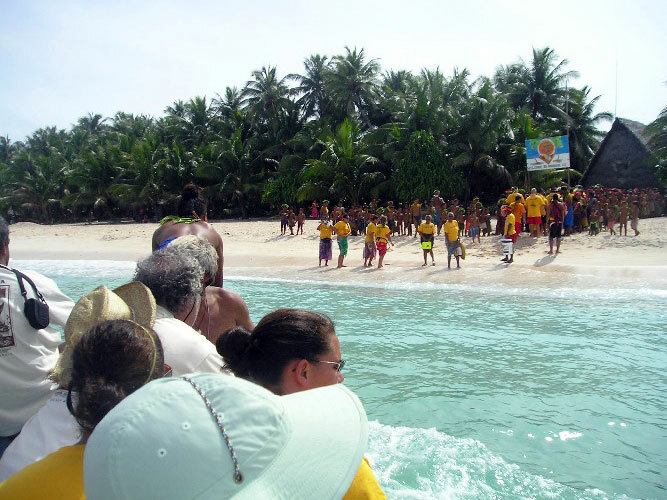 SATAWAL, Micronesia » With the sound of children singing and conch shells blowing, the crews of the double-hulled canoes Hokule'a and Alingano Maisu touched the shorelines of Satawal island, home of the father of the Hawaiian voyaging renaissance, Mau Piailug. 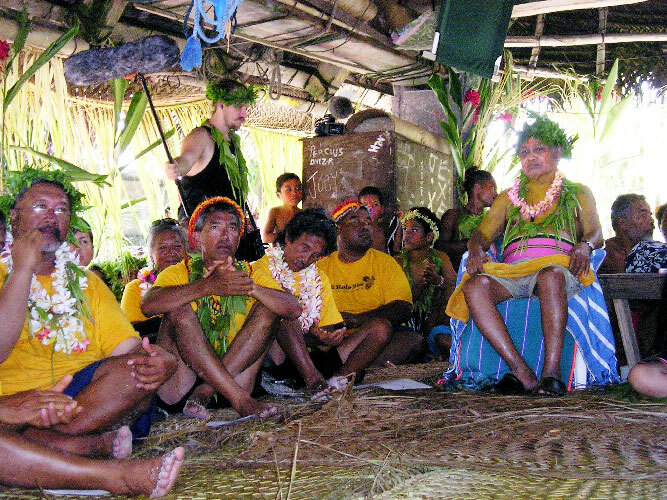 Satawal islanders greeted the crews with songs as they walked through a reception line into a meeting house of thatched leaves. The pilgrimage to deliver the Alingano Maisu as a gift to Piailug had taken more than 3,500 miles and honored the Satawalese navigator who had guided Hawaiians on the 1976 Hawaii-Tahiti voyage, supporting the assertion that Polynesians were capable of deep-sea voyaging centuries before Europeans. On the Alingano Maisu were seven Satawal crew members, including Piailug's son Sesario Sewralur. The storm clouds that had been with them for several nights opened on Satawal this morning, with a light breeze from the north. Satawal, about a mile long and a half-mile wide, lay ahead with a stretch of white beach topped by dense foliage of coconuts, breadfruit and naupaka. SATAWAL, Micronesia » Hokule'a navigator Nainoa Thompson said native Hawaiians had lost the art of navigation for centuries. But Mau Piailug restored their pride as a seafaring people. During the journey to Satawal, the crews came for the most part in the way they had been taught by Piailug, navigating without Western instruments, sometimes even without the stars and moon as guides during stormy nights. From Majuro to Satawal, they came steering west, often using only the wind and waves from the northeast and east rocking below the decks of their vessels. They came, men in their prime of life who as youths sailed Hawaii-Tahiti with Piailug, young men and women who were the next generation of navigators, as a testament to this navigator from Satawal. They came not only bearing the gift of the double-hulled canoe Alingano Maisu, but also themselves as gifts, the promise to Piailug of another generation of navigators to carry in their vessel the culture of Polynesia and Micronesia. They came as a manifestation of Piailug's dream -- his stated reason for sharing his knowledge of navigation was to encourage his islanders one day to resume their tradition of deep-sea voyaging. Beneath their feet, beneath their double-hulled canoes, the Polynesians and Micronesians traveled the path of their ancestors. The crew members will be meeting with the chiefs of Satawal tomorrow (Hawaii time), then preparing during the weekend for ceremonies inducting navigators -- including Thompson -- into the same school of navigation as Piailug. The induction of a navigator into "Pwo" recognizes his ability to not only navigate, but also to have qualities of humility and care for other human beings. "The life of a navigator is service, and one can only serve if one is a good person," one observer said. The last leg to Satawal turned out to be one of the most challenging, a final test of navigational skills before they saw Piailug. After several hours of pelting rain and several squalls that blocked the moon and stars a couple of nights ago, the Hokule'a continued to sail hard before the wind to meet its scheduled arrival in Satawal by Friday. Thompson wanted to find the relatively large island of Pulat before making a shift to the tiny island of Satawal, about the size of Rabbit Island near Oahu but standing about 8 feet in elevation. Thompson said he had made the decision to sail as hard as possible through the night and then slow to find Pulat in the morning, but he was unsure if visibility would improve. The crew could sometimes see as far as 10 miles and then no more than a mile, as winds of 20 to 35 mph blew storm clouds by them. "I can't tell you where this storm is going to end," Thompson said. "But we're going to sail hard to Satawal. We should do nothing less for Mau." When a blustery wind began to make the canvas moan and shudder, Thompson ordered the crew to raise the sails to save the mast from ripping. The crew members were shadows in the darkness, and some used head lamps to help them untie the ropes from the mast. "Don't let it get away from us," Thompson shouted. Thompson turned to Hokule'a's most experienced crew member, Makanani "Maka" Attwood. "Maka, close the sails," said Thompson, waiting about 15 seconds before asking, "Ready on the mast?" "OK, close the sails," Thompson said. "One, two, huke," Attwood shouted to the crew. They pulled several ropes and slowly raised the boom holding the crab-claw sail as the wind pressed and shook the canvas. After the sails were closed, the wind from the north howled as it passed the vessel, rocked the double-hulled canoe and turned it upwind even without the sails. After the wind passed through the darkness, a crew member said of Thompson, "Boy, he called that one. I didn't see that coming." Five minutes later, when the wind from the squall had passed, Thompson ordered the crew to raise the sails again. The crew lowered and raised the sails throughout the night. Two hours into the morning, Big Island resident Max Yaramawai sighted Pulat -- first a shadow in a bank of clouds on the southwest horizon, then an emerging atoll with a white stretch of sand and a green head of coconut trees.